Asclepias curassavica seeds burst from the pod ready to fly away. Sidalcea oregana, Oregon Checker Mallow, adds a welcome bit of color to the Northwest Territory. Pretty new foliage on Vaccinium ovatum, our native Huckleberry. Their berries are getting ripe. I love huckleberry pancakes! Current bee-magnet, a NOID Caryopteris. More of my favorite blue in the out-of-season blooms of Ceanothus 'Victoria'. Cyperus involucratus 'Baby Tut' is filling out and getting taller. It's supposed to be 18-24" high. A big truss of Rosa 'Sally Holmes'. The fuzzy, white reverse of the leaves on this Eriogonum. The minute, colorful flowers of Mahonia gracilipes. 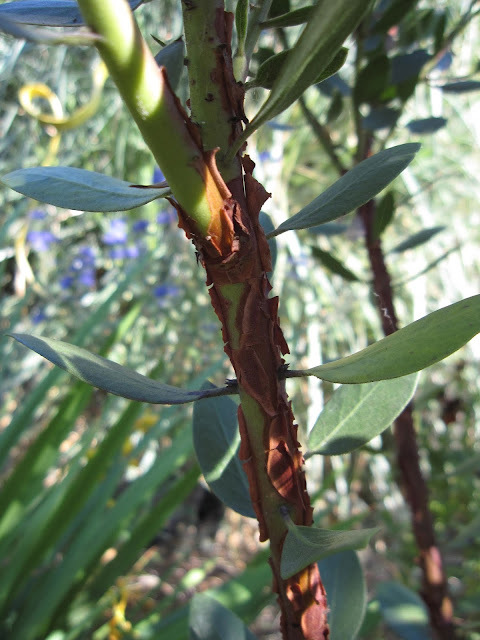 The peeling, cinnamon-colored bark of Arctostaphylos 'Austin Griffiths'. Big, red, ripening Beefsteak tomatoes I can't wait to eat. What's looking beautiful in your garden this Labor Day weekend? Can you guess from the picture below? No, it's not the Meliathus major you can see here. It's not the 'Flame' Calla, the Eucomis comosa 'Sparkling Burgundy', the Eryngium varifolium, or even the Trachycarpus fortunei photo-bombing in from the right. It's none of the summer stars of this picture, because it's a complete workhorse in my garden. Yup, it's bamboo. Four Fargesia robusta 'Campbell' bamboo to be precise. 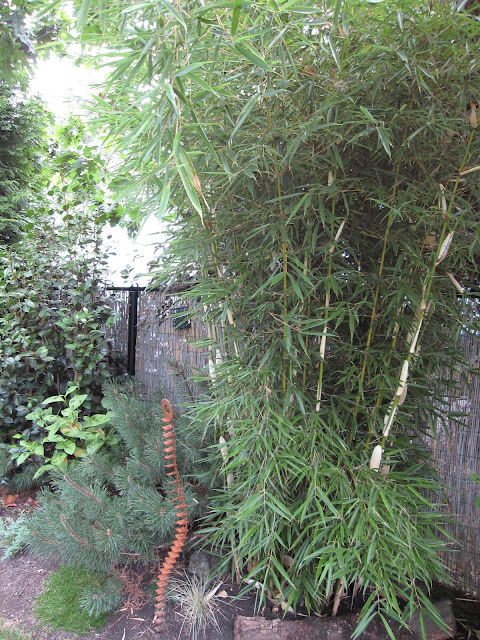 We started out six years ago by planting a Phyllostachys species to screen us from the adjacent neighbors. It filled in fast and was giving us appreciable privacy within two years. But it was a little too robust and we got worried we wouldn't be able to keep it controlled. 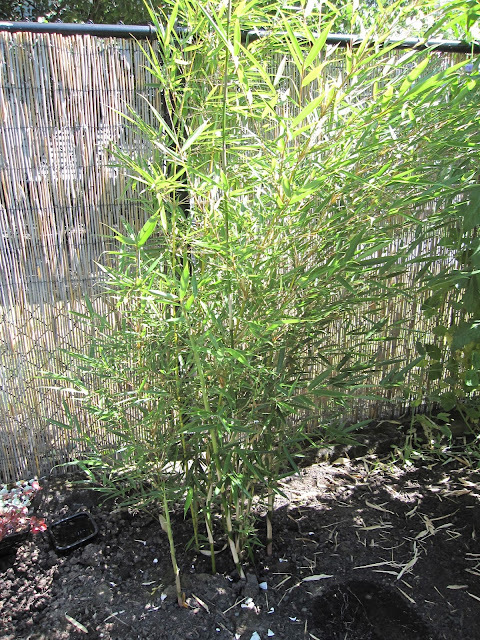 I posted about removing it here and then about getting some replacement clumping bamboo here. 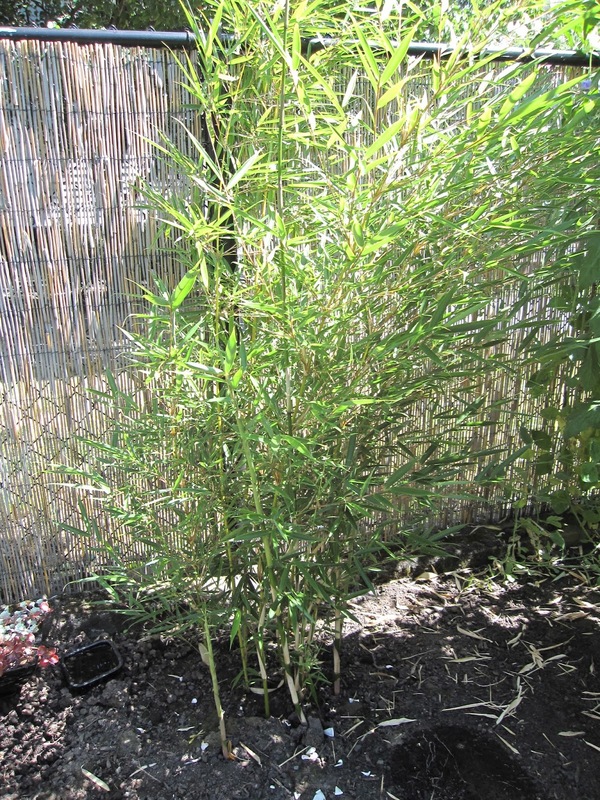 Those expensive new gallon pots from Bamboo Garden looked pretty wispy, with just three or four culms per plant when we put them in the ground in autumn of 2010. You can just barely see one of those skinny little clumps below, against a fence pole to the left of the tomato cage. This was in early summer of 2011. But by 2012, the individual clumps had at least twice as many culms. And they were thickening up. This year, the southernmost, sun-exposed two clumps are nearly meeting overhead. The clumps in more shade still have a way to go, but they are getting closer to each other. We chose this species and cultivar because it is one of the most upright hardy clumping bamboos that is sun-tolerant. We wanted the narrowest possible screen so we wouldn't be giving up a lot of garden space, and the arching canes of 'Campbell' can be pruned for a more upright look. And I love the look of the white culm sheaths that stay for months on the newest canes. 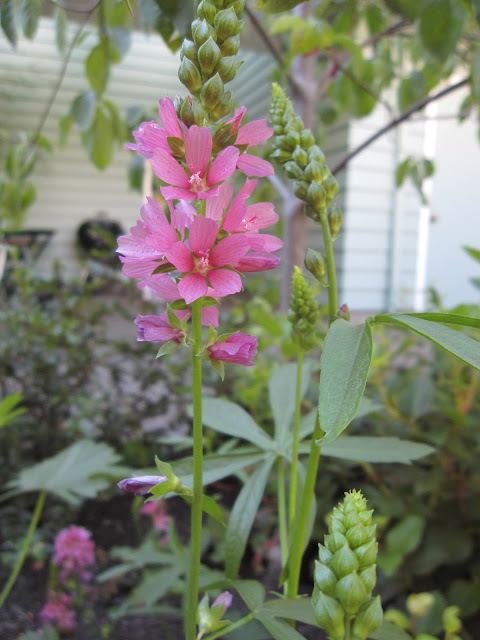 And the reason it's my favorite plant in the garden this week? Because summer is waning, and I can see ahead to winter days when all summer's perennials have died back, and our Fargesia robusta 'Campbell' will continue to form a beautiful green screen along the fence line. That's when I'll be loving it even more than I do now. If you want to see what other bloggers are loving in their gardens, pay a visit to danger garden for the weekly favorites roundup. I simply could not believe it when I realized today was the 15th of the month! It's Bloom Day, once again, and summer is racing past me at a breakneck pace. So I'm going to keep my post fairly short, and just show you flowers that you haven't already seen this year. We are completely thrilled to announce that our Indian Paintbrush (Castilleja miniata) seems to like it in the Northwest Territory. The flowers really are that amazing, saturated red. It's practically electric! This late-blooming Crocosmia is variously known as 'Citron' and 'Golden Fleece'. Whatever you choose to call it, it's a welcome, fresh hit of bright golden-orange in late August. Another late-summer bloomer is Langerstroemia 'Natchez'. We moved it in early spring, and I was wondering how it would do this year, but our long hot summer was just the ticket to blooming success. Crape myrtles seem underused in Portland, but I have always loved their slightly Southern charms. I'm looking forward to some beautiful bark as this one matures, too. I'm sure I've shown Sisyrinchium californicum in a Bloom Day post this year, but I really can't resist adding these shots. They are such cheerful summer-long bloomers and they support pollinators, too. No wonder we have so many volunteers! 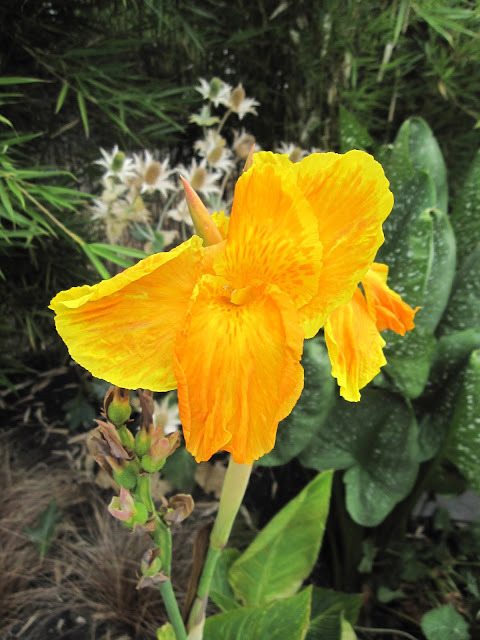 I wait all year for Canna 'Pretoria' to bloom. 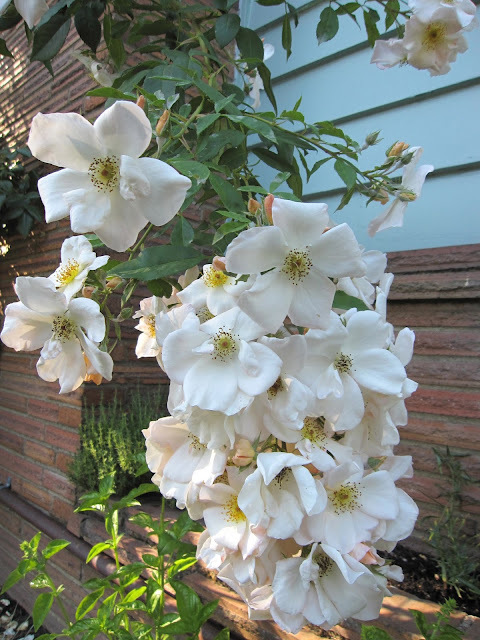 It's fleeting, but timed perfectly for August's Bloom Day. One of the Penstemons added to the Northwest Territory is finally blooming. I'm pretty sure this is P. serrulatus, or Cascade Penstemon. Last, an anomaly: Loropetalum chinense 'Sizzling Pink' is sending out a few fluttery flowers. Its main bloom time is April, so this little surprise is welcome in the heat of summer. I love the bright magenta flowers against its dark purple foliage. Bloom Day is hosted monthly by Carol of May Dreams Gardens. Pop over there to see other wonderful flowers for August! 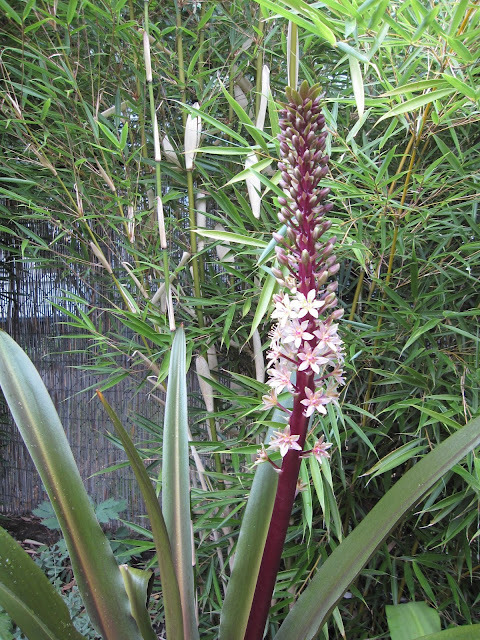 This week's favorite plant is Eucomis comosa 'Sparkling Burgundy'. 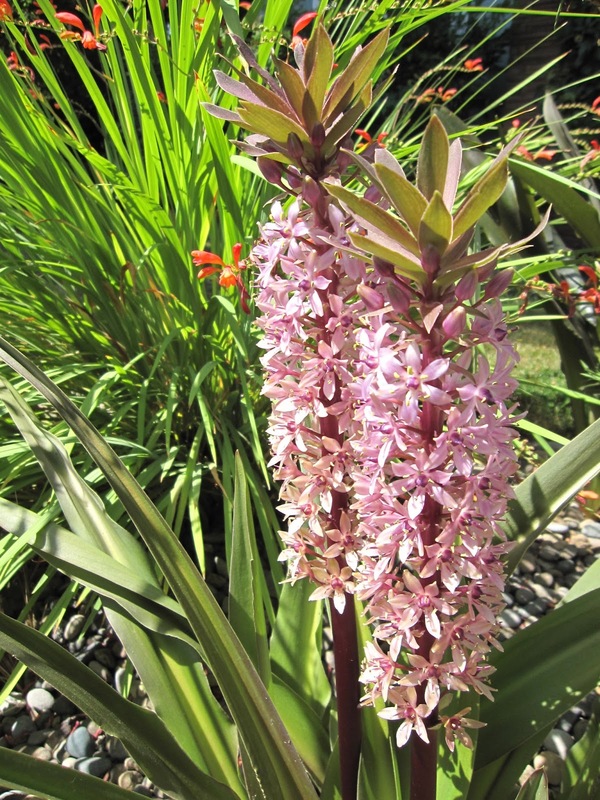 This South African bulb has striking maroon-tinged leaves that slowly green up as the plant sprouts deep burgundy flower stalks surrounded by pink to purple florets in summer. I have three plants blooming in two different parts of the garden this year. My two plants in the front garden were moved early this spring and have responded amazingly well after being unceremoniously uprooted and replanted. The remaining plant in the back garden has been a little slower to bloom this year, but is looking just as good. This is my third summer growing 'Sparkling Burgundy', and the first year I've had more than one bloom on the same plant. 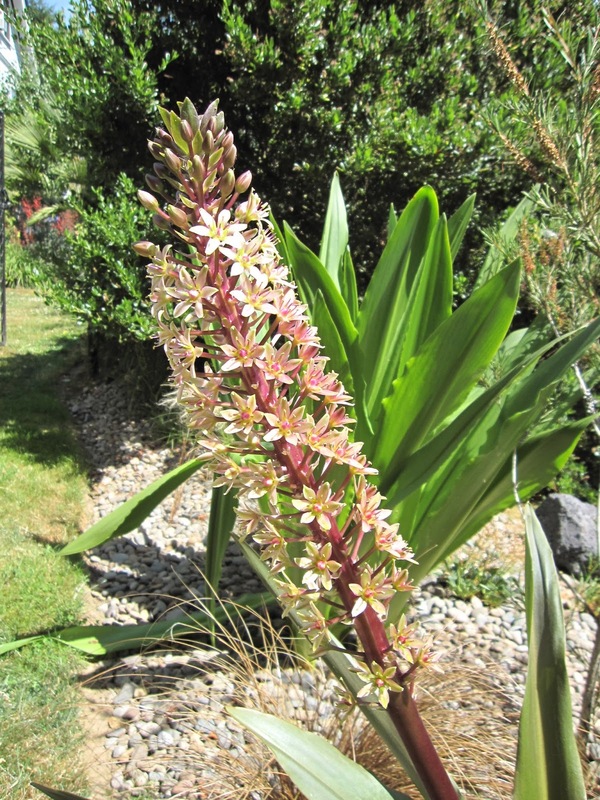 Since these two were the earliest blooms, they're now showing the characteristic leafy topknot that gives Eucomis its common name: Pineapple Lily. "Favorite Plant" posts are corralled weekly at the danger garden blog. Check the comments section for links to what's floating the boats of other garden bloggers this week!